The Spiel (Essen) 2014 – Pre-Orders? We are looking at trying out something new this year – specifically, we are looking to go to The Spiel (Essen) 2014. We looked at this once before and just couldn’t see how to make the maths work back then (over 4 years ago); but we are hoping that we’ve now grown sufficiently that we have the customer base to make it work. On that note, we have a few questions for our customers. Author adminPosted on July 29, 2014 Categories businessTags business, essen 2014, strategy, the spiel4 Comments on The Spiel (Essen) 2014 – Pre-Orders? Canada has about 35 million people. California has 38 million individuals alone. We have about 8% of the population of the United States, which means when you think about it, we have 1/8th of the potential target market than the US. If you are in the US and catch say 1% of the market, you are doing extremely well. Here, we’d have to catch 8x the number to just be equal. It also means that when you look at potential employees, you have a significantly smaller ‘base’ to hire from which can lead to interesting hiring decisions. What’s a legitimate market in the US might not be so in Canada, or at least, is very much more difficult to capture at a ‘reasonable’ size. Here’s another fun part – smaller population means fewer suppliers. If you get a bad supplier in Canada, you might just have to live with it because there’s no competition. You also have fewer options in terms of geographic spread – many suppliers are smaller than in the US (e.g. Alliance and ACD are both multi-warehouse companies) and we often end-up having to ship from Ontario for our stock. Again – no choice, few suppliers. It also means you have much less leverage – you can’t play one supplier against another. This is particularly interesting when you look at things like shipping or our card processors. In the US, you could ship via UPS, FedEx, US Mail or do a combination system with local and international couriers. In Canada, once you do decent volumes there is no better option than Canada Post for residential delivery. We are a much bigger country than the US. Sure, 75% of our population is within a 100 miles of the border or so, but many of our customers actually live outside of that 100 mile border zone. It both makes e-commerce businesses highly valuable (and has driven the adoption of eCommerce at a faster rate than in the US) but also means that the cost of delivery is significantly higher as the volume of products flowing is lower (less economies of scale). I should also add we have Quebec in there – an entire province that we get relatively few orders (proportionally) due to the language barrier. We could target them, but then we’d have to translate the site to French, stock translated games, etc. And again, see earlier comment about population size – there’s really only so many suppliers possible in any one marketplace. Lower population, fewer suppliers, less economies of scale and a bigger country all lead to generally higher costs than the US. Add in our higher overall minimum wages and various additional costs and your general Canadian business runs at a much higher cost level than your US business. Worst, the smaller population means for a niche business like us means that it’s harder to spread the fixed cost around, meaning overall lower profits for a longer period in my experience. So, what do you do when your costs are higher and your market is hard to reach – up your prices of course. You need more revenue per person, and so long as the demand curve doesn’t drop off too bad, that should work…. Which is the explanation of why everything costs more than you’d expect. On the other hand (and this is mostly anecdotal); we seem to have a lot less red tape than in the US. For example, our ta system is a lot less elaborate than the US’s. Getting business licenses is relatively easy as is setting up a business and so-on, so-forth. You can actually set-up and run your own business with a lot less hassle it seems than in the US. Again, this is mostly anecdotal. So, I haven’t really posted much about why we are moving. And it’s obvious because most people who come in ask – why did we move? The simple answer? We had outgrown the old location and needed a larger spcae. This is easily seen by the number of days it took to set-up. Our last move 2 1/3 years ago took us 2 days with 3 helpers on day 1 and myself on day 2. This office move took 4 days, with up to 9 helpers on day 1 and varying numbers for the next 3 days (minimum 5 of us!). So, the amount of work needed to move product out of the old location, move it into the new location, set-up new shelves, build new shelves, etc was significantly higher. We had built out the old space so tightly that there really was no wasted space left – we figured we could (maybe) squeeze in another 2 shelves before we hit full capacity. If we wanted to grow, we had to move. From an outside perspective, the easy answer is grow. After all, a bigger space means more stock, more product, more sales. More money right? Not always. In fact, during the growth stage it means less money. How much less depends on how aggressive your growth targets are (and how long your lease is!). The additional space cost, the set-up cost, the downtime, all of it are expenses. It’s nice to grow, but with growth comes additional expenses. Your fixed expenses balloon and you now have to make more money to cover them before you can get back to your previous levels of profitability. There’s also another advantage of staying – you force yourself to get more streamlined and efficient. If you only have so much space, you learn to get creative about storage. You watch your inventory like a hawk and move dead product out faster because you need the space for product that still sells. With more space, with higher growth, you can let things like that slide. For us though (okay, me); the decision to stay still or grow is relatively easy. I have long-term goals and those don’t work for where we are; so grow it is. I’m not going to post much about the move beyond to say that it was murderous and I made a major mistake by underestimating exactly how much work was involved. We had grown in our old space so well that when we actually made the move, I had not realised exactly how much we had grown – and the logarithmic increase in work setting up the space meant. So now what? If you look at the photos you might see a huge expanse of free space in the back of the warehouse and even in the office. Obviously, Starlit is going to continue growing. We have plans to expand our miniature and miniature accessories further. I am considering going ‘deeper’ on popular games so that we do not stock-out as often. There’s this entire CCG craze that we are missing (and might continue to miss on purpose). One of the reasons why I brought it up today is to discuss pricing. 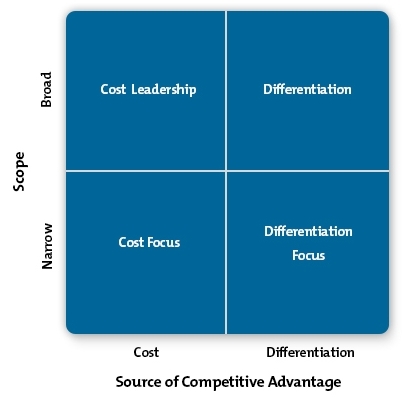 If you see the above; generally you can see that there are 2 major options – either a cost or a differentiation strategy. Within cost strategies, you can try be cost leader in the general market (everything to everyone ala Wal-Mart) or you can focus on a smaller market and be the cost leader in that area (e.g. Future Shop in its attempt to corner the electronics market). At a glance, you’d think Starlit Citadel was taking a cost leader or cost focus strategy. Actually, we attempt to focus on differentiation as much as possible. A lower price than MSRP is to keep us competitive, but the free shipping offers, rewards program, video reviews and our borad selection are all ways for us to differentiate ourselves. We have like one of the three (efficient logistics). A low cost base requires would require us to move to a small city, preferably in Alberta or Saskatchewan (lower minimum wage). Neither of which we are interested in doing. And as for capital… well, we just aren’t at the size to make most of the capital / tech purchases cost-efficient. At the end of the day, even those companies that compete on price (e.g. Wal-Mart & Target) end up differentiating themselves in other ways because customers do not just buy on price. There are always other considerations, whether it’s brand, selection or other benefits. It’s why Porter’s diagram is just ‘general strategies’; as you dig deeper in and it’s all differentiation strategies. You have to be different, and price just isn’t enough.